People at work often make agreements in which they commit to cooperate — to share resources, to assist each other, or not to harm each other. Some agreements work. Some don't. What makes agreements durable? The Japanese battleship Yamato during machinery trials off Bungo Strait, 20 October 1941. To avoid an arms race, the great naval powers had agreed to a sequence of treaties from 1922 to 1936 constraining the sizes and numbers of capital ships they could construct. 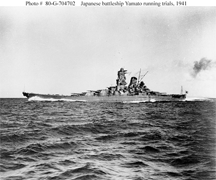 In 1934, Japan withdrew from the treaty (and the League of Nations), and in 1937 began construction of the Yamato. Its great size was intended to enable it to engage multiple U.S. warships simultaneously, a capability that was believed necessary because of the industrial capacity advantage of the U.S. Thus, although the battleship treaties provided incentives to signatories to adhere to the treaties, for Japan there were even greater incentives to abandon them. For more, read the Wikipedia articles, "Treaty battleship" and "Japanese Battleship Yamato." The photo is part of the records in the Yamato Museum (PG061427). It is available from Wikimedia Commons. If you're responsible for people or resources — most of us are responsible for at least ourselves — you probably make commitments at work. You commit to do something (or not to), at a certain pace, or by a certain date, or within some constraints. Sometimes the commitment is part of an exchange: I'll do this, and you'll do that; or I won't do this, and you won't do that; and so on. When commitments are part of exchanges, we sometimes call them informal agreements. Rarely are they written down, though they might be; rarely are there handshakes, though there might be. Most agreements actually work. What makes agreements durable? Here are some of their attributes. Bilateral agreements are based on mutual consent. In a unilateral agreement one of the parties believes there is an agreement, but the other doesn't, or is unaware of any agreement. For durability, both parties must be aware that a deal has been struck. Even if both parties acknowledge existence of an agreement, they might not agree on the terms. It's essential that all concerned agree about what's being exchanged, and how it will be exchanged. Neither party is coerced — not by the other, nor by events, nor by another party. If coercion drives the bargain, the agreement is durable only while coercion persists. on the termsequal information about the value of the items exchanged and the framework of the exchange. That is, both parties estimate the agreement's fairness equally accurately. If one party has better information than the other, then when the second party "wakes up," the deal often implodes, or the relationship sours. When the agreement includes incentives, the value of the incentives to each party is roughly identical. Incentives that mean much more to one party than the other are likely to lead to non-performance by the party that has lesser regard for its incentives. When the agreement is confidential and sub rosa a trap awaits, because there can be an incentive to breach confidentiality. The first party to admit to a sub rosa agreement can sometimes avoid the penalties of having made such an agreement, even after harvesting value from it. Would you like to see your comments posted here? rbrenmGAiCXRfxRURYXzSner@ChacaCuqiDLivhIwOaNwoCanyon.comSend me your comments by email, or by Web form. When the boss or supervisor of the chair of a regular meeting "sits in," disruption almost inevitably results, and it's usually invisible to the visitor. Here are some of the risks of sitting in on the meetings of your subordinates. Negotiation skills are increasingly essential in problem-solving workplaces. When incentives are strong, or pressure is high, deception is tempting. Here are some of the deceptions popular among negotiators. See also Workplace Politics and Project Management for more related articles. I offer email and telephone coaching at both corporate and individual rates. Contact Rick for details at rbrenbSzUhwGcWKGtAeymner@ChacpQComUyOSVzBKHdmoCanyon.com or (650) 787-6475, or toll-free in the continental US at (866) 378-5470.